The FIRST Luxury Sports Rug. 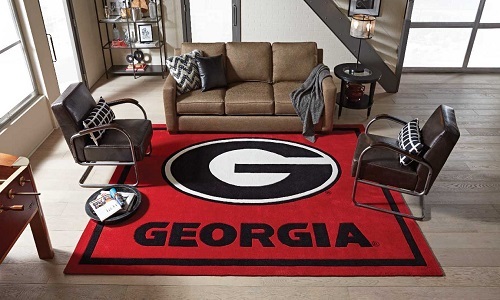 These licensed collegiate rugs are handcrafted of soft polyacrylic yarn in a plush pile construction, and are hand-carved around school logo and name. These durable and luxurious rugs are offered in four sizes. Perfect for casual living spaces, offices, and youth bedrooms. Visit us at Booth 3126 and the New Product Zone. The FIRST Luxury Sports Rug. These collegiate rugs are handcrafted in a plush pile construction, and are hand-carved around school logo and school name. Along with high quality cotton backing, these features produce a durable and luxurious rug, and are offered in four sizes. Visit us at Booth 3126 and in the New Product Zone. We are licensed with many of the most popular universities, with more on the way. Follow us on Facebook and Instagram, or visit www.luxurysportsrugs.com.